3 BEDROOM | 2.5 BATHS | 1967 SQ. FT.
Why choose a Artesa built home? The builder is on the job site everyday, attention to details is the name of the game. They make sure every detail is covered. Quality products & craftsmanship are synonymous at Artesa Homes. Impressive high quality finishes complete every new home & NO 2 homes are ever the same, every home is UNIQUE, no cookie cutter homes here. 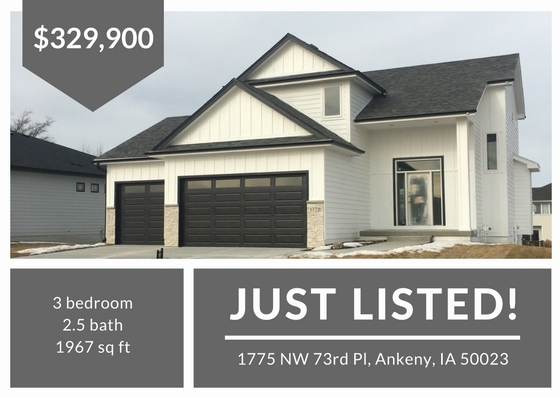 Now is the time to customize this 2 story home nestled in Autumn Ridge Dev, where taxes are low but the amenities of Ankeny abound. Make this home your own! 3 BEDROOM, 2.5 baths, 3 car garage. Choose from Granite or Quartz countertops, upscale lighting, soft close cabinets, quality appliances, custom trim work, trayed ceilings, and MORE! This builder will make sure you close on time, NO Delays.